Join us at our Annual Golf Fore Kids’ Sake and enjoy a day on the course while supporting children in Guelph! Golf Fore Kids’ Sake is BBBSG’s signature annual golf tournament, raising funds for local youth through our programming. Last year’s tournament raised over $35,000 for kids in need in our community! We’re aiming for a hole-in-one this year and trying to drive right past that record! With 137 kids on our waiting list, it’s time to tee up for a great cause! Sponsorship funds from companies and individuals like you help to support the efforts of dedicated people who help 700+ children and youth who need a mentor find a mentor. Your sponsorship will make a difference. We would like to offer you an opportunity to be a sponsor for our 17th Annual Golf Fore Kids’ Sake Tournament. View the Golf Fore Kids’ Sake Sponsorship 2019 Prospectus to learn more. 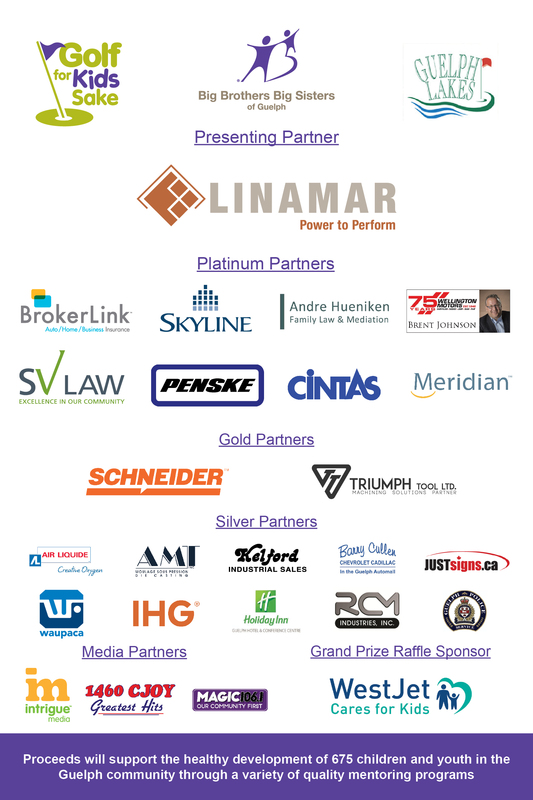 As a valued sponsor of this event your company will receive positive recognition and awareness with many area professionals who will be participating plus visibility on promotional material, signage, program listing and emcee call out. Thank you in advance for your consideration.